Detroit and Kansas City are tied for the lead in the Central division with 39 points each, but the two teams are apparently heading into opposing directions. 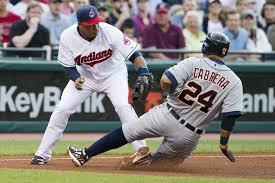 The Tigers have won the first two games of the series against Cleveland and are on the verge of sweeping the hosts. This would be a fitting revenge after the Indians won three games in a row in Detroit earlier this season, but it would also mean a great deal for the Tigers in their quest of consolidating their position at the top. By contrast, the Royals are struggling recently and have lost twice at home against Seattle, with the Mariners limiting the hosts to a handful of runs. Even though Kansas City is slightly favorite to prevail, the match could go either way and the Tigers need a victory to make sure they stay at the top. The good news is that they have Max Scherzer fit to play and he will take the mound hoping to turn his season around after a rather disappointing outing. He was hit heavily in his last start and allowed plenty of runs, but the manager kept him on the pitch, hoping that Max will return to his winning ways. The last time he played against the Indians, he allowed seven runs and in the end his team was defeated by 11-10 in the 13th inning. All the indicators suggest that tonight things will be different, as Detroit scored a total of 11 runs in the first two games. The only problem is that they allowed four on each occasion and will need Scherzer to do better than that, something that seems plausible since he has an earned run average of 3.84. The starting pitcher can consider himself lucky to have won eight decisions while losing just three this season, but his teammates have all the merit. The Tigers will try to provide Max with enough support for him to add his ninth victory, while the team as a whole will expand its advantage over Kansas City. Josh Tomlin will be the starting pitcher Cleveland will oppose to Scherzer, but he has very few reasons to feel optimistic ahead of this fixture. In his last start against the Los Angeles Angels, Josh was tagged for six runs and also gave up 11 hits, leading his team with no chance to win the match. Overall he split his eight decisions and has a 3.86 ERA, quite similar to the one posted by Max, mostly due to the subpar performance of relievers. Bullpen problems have tormented the Indians all season long and they seem to be far from over, with Detroit winning both games so far in the final innings. It was a bit surprising that Cleveland managed to score twice in the last two innings, to level the score and pushed the game into overtime. Unfortunately for them the visitors scored the decisive point in the 10th inning and they are now just one win away from sweeping the Indians. Bookies are clearly unimpressed by the fact that the Tigers play on the road and give Scherzer credit despite his recent struggles. The odds are quite attractive at 1.80 for Detroit to win outright and there is no point for punters to take additional risks for slightly better odds. The Tigers to win by two runs or more is a wager valued at 2.35, but given the fact that the first two games were both narrow margin victories it is better to avoid unnecessary risks.